6 − 3 = Required Please enter the correct value. "It Began in a Wisconsin Scrap Yard… Then Developed into the U.S.
Twenty-four years ago, while salvaging junk at a local scrap yard, J.B. Straubel came across a discarded golf cart from the local Alpine Resort in Egg Harbor, Wisconsin. Eventually found its way into the hands of NASA's leading satellite expert. Helped create top-secret, high-altitude military aircraft that, evidence suggests, are now being used by the U.S. Missile Defense Agency and DARPA. Transformed a broken down, 30-year old, 150HP car into one of the fastest vehicles on the planet. And it made Straubel over $164 million. Today, his invention is at the center of a sensitive operation. From energy, to transportation, to computing. Forbes describes what Straubel is working on as "world-changing." Wired Magazine believes it's starting "a truly transformative revolution." Are all fighting to partner with Straubel on what he calls BlueStar. Which is why you need to understand what's developing. So in this short presentation, I'm going to shine a bright light on Operation BlueStar. I'm going to brief you on what it is… what it's capable of. Where an overlooked tech outfit that has strategically set up offices in eight states – could see its share price begin to surge 2,000%, nearly overnight. So we don't have much time to waste. My name is Michael Robinson. And my career as a board member and senior strategist for a Silicon Valley venture capital firm has allowed me to take part in some of the most exciting technology breakthroughs of the last three decades. For example, in the early '80s I was attached to sensitive military projects tied to President Reagan's Strategic Defensive Initiative. In the late '90s, before "cloud computing" was a buzzword and a $160 billion industry, I was one of five people taking part in a meeting in Oakland, where this big data phenomenon was first being mapped out. After the millennium, I worked with Dave DeWalt, the former CEO of McAfee, on cyber security technologies. You've probably heard the catch phrase the "internet of everything" being bandied about these days. Well, I was directly involved in the development of a prototype of the microelecromechanical device that is making "the internet of everything" a reality. 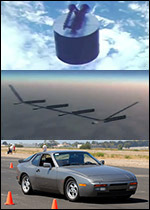 In 2006, that advanced sensors prototype technology was sold for $126 million. And now, it's at the forefront of what is about to be a $7 trillion global industry. Today, I serve as Money Morning's Director of Venture Capital and Technology Investing. This allows me to leverage my connections and expertise, so I can get everyday folks in on the ground floor of the companies that have developed massively disruptive technologies. This is something that has been cut off from investors on Main Street for too long. But I'm fighting to change that. My work has even been nominated for a Pulitzer Prize. You see, even though J.B. Straubel and I have never crossed paths, and my team and I have never collaborated on any projects with him, I run in the same circles as he does. What I mean is, some of his business partners are associates of mine. I've worked with them personally. Especially those in the defense sector, who harnessed his propulsion system for state-of-the-art and highly classified military aircraft. I'll talk about that ahead. The identity of Operation BlueStar's "silent partner." I'm going to walk you through everything I have dug up from my investigation. Because we have to move quickly, so you can take advantage of it. That's how big this is. So I'm going to start by explaining the evolution of the technology powering Operation BlueStar. This is really important, so please follow along closely. I'll Admit, Nobody in Their Right Mind Would Ever Look at Your Run-of-the-Mill Golf Cart and See a Space-Age Propulsion System. After all, your average golf cart only sports a modest 11 horsepower engine. So if you were to take it out on the open highway, you'd be able to run it up to about 15 mph by pushing the proverbial "pedal to the metal." He dismantled it. And by using spare parts, what he built would evolve into a new generation of propulsion technology. You see, like many breakthroughs, its beginnings were humble. Straubel took an early model of his propulsion system and added a micro turbine and high-speed flywheel to it. This placed him at the center of a $24 million project that was being funded by two technology pioneers. Harold Rosen and his brother, Ben. Harold Rosen is an aerospace engineer known as the "father of the geostationary satellite." He got that nickname because in July of 1963, he launched the Syncom II geostationary satellite, 22,300 miles above the earth. It was the first of its kind to reach orbit. Ben Rosen was the former chairman of Compaq Computers and a renegade venture capitalist. This is where the seeds of Operation BlueStar were planted. Because, with these high-powered forces backing him, Straubel was able to upgrade his innovation. Now it incorporated a gas-turbine hybrid powertrain, with an energy storage subsystem that used regenerative braking. And the early findings suggested that this propulsion system would be able to double the current range and performance of existing technologies. It wasn't long before it would blow away those expectations. It was also believed to be perfectly suited for military applications. And that's exactly where it landed next. Straubel Founded the Aerospace Firm Volacom. 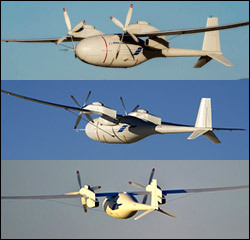 At Volacom he partnered with the Rosen brothers once again and began designing unmanned aircraft that utilized a specialized high-altitude, long-endurance propulsion platform. Now, his innovation had the ability to fully harness hydrogen power. And it wasn't long before the defense contractors came calling. Boeing first licensed Straubel's technology for a fleet of military aircraft they were building. What you're seeing on your screen now is a photo of Boeing's Phantom Eye. It was developed for the U.S. Missile Defense Agency. These photos were taken by NASA. Video does exist of the Phantom Eye in flight. But I can only show you these photos, because that video of the Phantom Eye performing drills is highly sensitive. I've seen it firsthand and it is amazing. I'll explain how I was able to do that in a few moments. Phantom Eye can fly to heights of 65,000 feet. And it doesn't need to land for four days. Now, while its inner specs are classified, you don't have to look too far to see evidence of Straubel's work. It doesn't burn off jet fuel… it burns off water. Just like his propulsion system at Volacom. So it's not too hard to find a possible connection. which stands for the Defense Advanced Research Projects Agency. 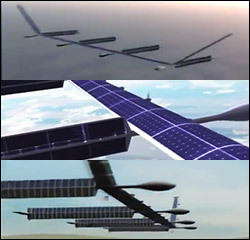 DARPA also turned to Boeing for a "pseudo-satellite" system they call Vulture. This program is so sensitive there is not even video footage from its flights that I was able to see. But what I can show you are the design animations that have leaked out. That is what's on your screen now. As with the Phantom Eye, Vulture's inner specs are classified, but Straubel's fingerprints are all over it. Vulture will be able to fly unmanned at heights of 90,000 feet. And it can stay up there without refueling – without any type of maintenance – for five years. 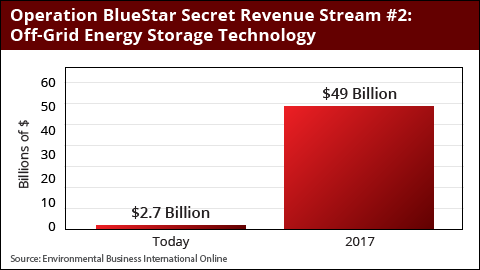 But they both share a fuel cell, energy storage breakthrough that, as you're about to see, is critical to Straubel's Operation BlueStar. And he developed that too. During my career, I've worked with high-ranking Boeing officials, including the President and CEO of Boeing's Defense, Space & Security division. So I have a lot of insight into their operations. Money always talks the loudest in the venture capital world. And it's talking especially loud here. Because Boeing acquired Straubel's company, Volacom, for an undisclosed sum. And it's safe to say it was a very large payday. So let me quickly recap this timeline. Twenty-four years ago, he found that beat-up golf cart. He began building prototypes of his propulsion system. That landed him a $24 million project to upgrade it, which he did. Shortly after, he took his invention and with his partners, the Rosen brothers, founded the aerospace technology firm Volacom. Now his innovation had become hydrogen-powered with a shockingly advanced energy storage system. Straubel was now building his own aircraft with it. So much so that Boeing acquired Volacom. And This is Where Operation BlueStar Officially Comes to Light. It's of a 1984 Porsche 944. At 150 HP, it's not their most powerful, or fastest model. The 944 would rank as the 4th slowest model they ever developed for American roads, and that includes their SUVs. However, a few years back, Straubel acquired this already ancient sports car. This former "slow Porsche" broke the world's quarter-mile speed record for its class. Now, Let's Fast-Forward to Today. Right now, J.B. Straubel is only 38 years old. So when he first came across that golf cart, he was 14. In the years that followed, he was awarded MIT's Innovator of the Year, joining a club that included the founders of Google and other leading tech minds. And he amassed a net worth of over $164 million. Yet, it's his celebrity business partner at his current venture grabbing all the headlines. They quickly co-founded a company. And now Bloomberg describes Straubel's role there as its "semi-secret weapon." Elon Musk's name doesn't appear on any of them. You'd Find Straubel's Name on Every Single Patented Technology… That Has Ever Been Awarded to Tesla (Nasdaq: TSLA) . Some folks know pieces of Tesla's (Nasdaq: TSLA) history… that it began from that discarded golf cart. But almost no one knows that shockingly similar propulsion technology is being used in top-secret military aircraft built to win the wars of the 21st century. 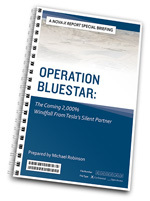 And even fewer people know the identity of Tesla's (Nasdaq: TSLA) and Straubel's "silent partner" in their most controversial and ambitious venture ever, Operation BlueStar. And rocket the "silent partner's" share price up 20-fold. This "silent partner" will allow Straubel to take his propulsion technology to a place it's not yet reached, which is saying a lot. Already, it's this very propulsion technology that's forcing car enthusiasts around the world to reimagine what an electric vehicle is capable of. After all, the Tesla (Nasdaq: TSLA) Roadster can go from 0-60 in a little over 3 seconds. The lower-priced Model S… 4.2 seconds. "Tesla has built a car that doesn't need servicing: no spark plugs, no oil changes, no regularly scheduled maintenance." In fact, Consumer Reports has scored its Model S 99 out of 100. That's the highest mark they've ever handed out. It is, in their eyes, the top-performing car on the planet. For comparison, the average Ford received a score of 50. A BMW? It's not even in the same universe… scoring a 66. This combination of high-end performance and low maintenance costs is why demand from the public is growing at a breakneck speed for Straubel's vehicles. In 2012, Tesla (Nasdaq: TSLA) sold 2,650 cars. The next year they surged to 22,450 units sold. And in 2014, they are on track for 34,798. Tesla (Nasdaq: TSLA) has fought off states stepping all over the free market to ban sales of their vehicles – to unleash a peak 1,245% stock price surge. I believe it's going to continue soaring in the future. But, as I'm going to show you ahead, I've set my sights on the other player in this story. You see, as I've been talking about, J.B. Straubel is spearheading a sensitive operation called BlueStar that could disrupt the entire automotive industry. You Could Make 2,000% Gains off its "Silent Partner!" Its identity is expected to be revealed in the coming weeks. The last major disruption to revolutionize the automotive industry occurred in the 1980s with robotics. I saw this up close. Back then, I worked alongside Lee Iacocca and Roger Smith, the CEOs of Chrysler and GM at the time. The U.S. was getting beaten handily by Japanese car companies who had modernized their operations. We had to play catch-up fast. And we did. The robotics revolution saved the U.S. automotive industry in the 1980s. Today, this sector represents about 4.5% of our economy. So you are talking about $737 billion a year, as it winds through car manufacturers, into car dealerships, mechanics, and similar businesses. There are about 8 million jobs in this sector. And the automotive industry is our country's #1 source for exports. Operation BlueStar Could Transform the Entire Automotive Industry. Morgan Stanley released its own investigation and determined that, "We are witnessing the most disruptive intersection of manufacturing, innovation and capital experienced by the auto industry in more than a century." Forbes Magazine believes "a revolution, a true disruptor" is coming. That's exactly what Operation BlueStar is. Because it will give Tesla (Nasdaq: TSLA) the ability to multiply their sales by a measure of 14 within three years to 500,000 units. Tesla (Nasdaq: TSLA) is Suffering From an Affliction That Strikes Many Companies Growing at Their Rate… "Capacity Constraint." They've publicly stated that they currently lack the ability to produce enough cars to meet their demand. But that's a bit misleading. In reality, what they don't have is the ability to create enough cars to meet the demand for their current lineup of vehicles. After all, sticker prices for their Model S run from $69,900 for the stripped-down version – all the way up to $133,670 for one that's fully loaded. Any way you slice it, at the moment, it isn't cheap. 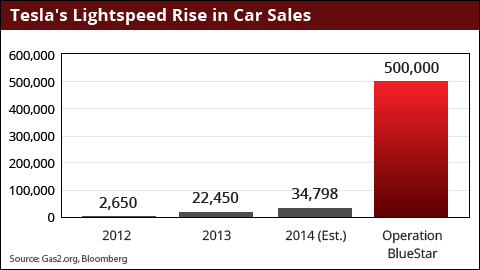 Which is why right now, Tesla (Nasdaq: TSLA) isn't capable of selling much more than 35,000 cars a year. And that's small potatoes in the grand scheme of things. The International Energy Agency Has Now Set a Target of 20 Million Electric Cars on the Road by 2020. 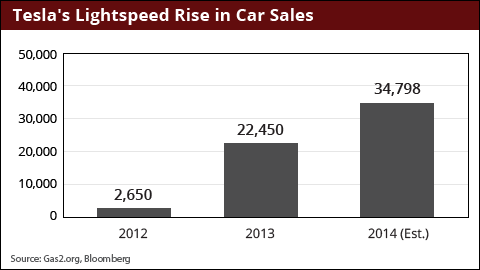 In order to take a large piece of that 20-million-unit, market-share pie… they have to be able to sell cars for $30,000. Thanks to Operation BlueStar… it's mission accomplished. And thanks to the "silent partner" in this deal – the fortunes of Americans who strike now… while there is still time… could be radically transformed. The Gigafactory is a $5 billion facility that will be constructed right here in the United States. At 10-million square feet – or about the size of 174 football fields – the production facility alone will be enormous. It will create 6,500 new, high-paying, American jobs. And it will allow Tesla (Nasdaq: TSLA) to build 500,000 cars a year. To put that in perspective – that is a 20-fold increase over last year's sales. Tesla's (Nasdaq: TSLA) work has already been described by the UK's Telegraph Newspaper as having the potential to be "an automotive game changer." But what could result from their collaboration with the Gigafactory's "silent partner" could be unprecedented. That's because this Gigafactory will usher in the mass adoption of electric cars. The costs of each Tesla (Nasdaq: TSLA) to roll off the assembly line will be dramatically lower. Especially concerning the most expensive part inside these electric cars… lithium-ion batteries. Most automakers rely on oversized, clunky single-purpose models. Tesla, (Nasdaq: TSLA) on the other hand, packages thousands of lithium-ion cells into one pack. These cells are similar to what we find in many of our laptops and other electronic devices. Once built, the Gigafactory will have the ability to supply the world's total current production of lithium-ion batteries – all in one place – right here in America. "The Gigafactory is there to support the third generation car." The third generation car – "Automotive 3.0" – is the $30,000 Tesla. And it can only move forward once Operation BlueStar's Gigafactory is built. The "Gigafactory" is Scheduled to Go Live in 2017. "Where" is the Unknown Factor. There are three requirements in play now. Gigafactory Requirement #1: The location has to have a certain climate and terrain. That's because it will be powered by solar and wind. You can see the rows of solar panels and wind turbines on the proposed design. And a lot of flat land. Which is why the 10-million square foot facility is just the tip of the iceberg. When all is said and done… the total land needed for Operation BlueStar's Gigafactory is over 1,000 acres. So imagine standing at the foot of the Ulysses S. Grant Memorial in front of the Capitol Building in Washington D.C.
Now stare all the way to the other end of the National Mall. Look past the Washington Memorial, the World War II Memorial, and the reflecting pool. And focus your attention on the Lincoln Memorial… all the way at the end. 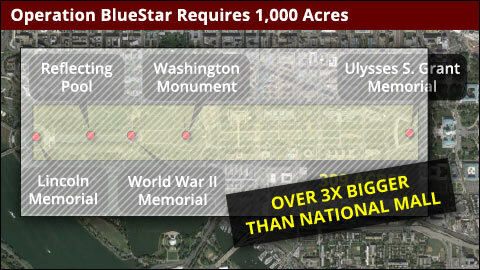 Operation BlueStar's Gigafactory Campus Will Be Over Three Times Larger Than the National Mall. But the size is only one factor in play. Gigafactory Requirement #2: The campus has to be built near a freight rail line. You see, depending on the specific model, the battery pack that powers these electric cars can weigh between 1,300-1,500 lbs. Or, as much as 33% of the total vehicle weight. And from the "Gigafactory" these battery packs get shipped out to Tesla's (Nasdaq: TSLA) plant in Fremont, CA. So the only way to haul a large volume of batteries is via freight. You'll come across four states that fit the billing. Texas, Arizona, Nevada, and New Mexico. And to nobody's surprise, they are all fighting to become the Gigafactory's home. Nine members of Arizona's U.S. House of Representatives have written Elon Musk begging to bring this plant to their state. The Mayors of Tucson and Mesa have as well. In Texas, Rep. Jason Villalba is pitching the tax advantages of bringing the Gigafactory to the Lonestar State. Governor Rick Perry has taken to Fox Business and other media outlets to make his case. New Mexico Governor Susana Martinez is promoting special state-funded road, water, and infrastructure projects to enhance the new development. And Nevada, like the others, is selling the low-tax benefit of opening up shop inside their state. They also have another unique advantage: "location, location, location." They are the closest to Tesla's home. So the full court press is on. However, the final requirement for the Gigafactory is the one you need to pay the closest attention to. Operation BlueStar Requires a "Silent Partner." Thanks to J.B. Straubel, Tesla (Nasdaq: TSLA) is proud to say that their battery packs, electric motors, on-board chargers, and universal connectors are all homegrown. However, it still requires the work of an army of suppliers, just to roll one vehicle off the assembly line. 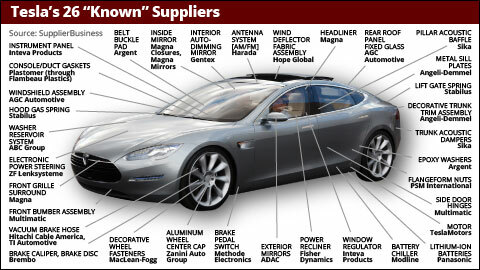 Tesla (Nasdaq: TSLA) keeps their full list of suppliers classified, but 26 are known to the public. They provide electric powertrain components for Toyota's RAV4 EV, Daimler's Smart EV, Mercedes' A-Class EV, and the Freightliner's Custom Chassis Electric Van. Speculation Immediately Began to Run Rampant About Who Will Be the Handpicked "Silent Partner." 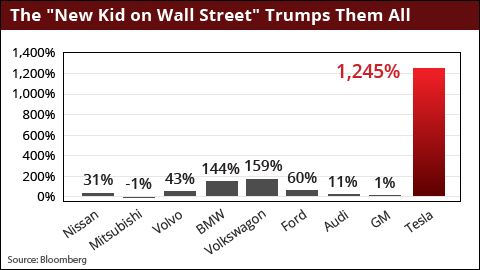 And initially everybody believed only Tesla's (Nasdaq: TSLA) current partners would make the short list. Japan's Panasonic was the early leader, since they do supply Tesla (Nasdaq: TSLA) with their lithium-ion cells. But they aren't guaranteed this business in the future. Japan's Sony is also in the conversation. In South Korea, LG Chem and Samsung SDI have been mentioned. In China, the companies being touted include Lishen, and Amperex Technology Limited. But many believe the frontrunner from this Asian superpower is BYD. That's because China controls 5.4 million tons of lithium – and BYD has developed China's top electric vehicle battery technology. Plus, years back Warren Buffett invested $230 million into the company. So that's a softball choice for the press. Why dig deeper than that? And Judging By These Shot-in-the-Dark Guesses, They Have No Clue Who the Real Winner Will Be. This "silent partner" will only stay "silent" for a short while longer. And when they officially step forward, they're going to make their voice heard in a big way. You see, as I mentioned, in my three decades in Silicon Valley, I've been directly involved in these types of venture capital deals. I've worked with the CEOs of J.B. Straubel's past partners – like at Boeing. Everything I'm hearing, and all of the evidence I've gathered, points to one company that, for many, is going to come out of nowhere. But if you follow the money… it leads you right to Operation BlueStar. I was recently at a breakfast meeting in downtown San Francisco with the co-founder of a firm connected to the lithium-ion battery industry. We were discussing some groundbreaking developments that could impact lithium-ion battery pack technology. You need three elements in lithium-ion batteries: lithium, graphite, and cobalt. A lot of people don't know that lithium-ion battery packs actually require ten times as much graphite as they do lithium. So if a potential "silent partner" in Operation BlueStar happened to have a competitive advantage in graphite technologies – that would give it a nearly insurmountable head start. Well, fortune smiles upon an exciting tech player, with a long list of graphite technologies. One, in particular, involves a thin graphite-polymer film sheet that is four times as conductive as copper and can withstand temperatures up to 400 degrees Celsius. That will surely come in handy inside high-voltage cars like the type Tesla (Nasdaq: TSLA) produces. This same unheralded tech company has just allocated $150 million to upgrading its facilities, so that it can accommodate a rapid demand increase for a device that connects to Tesla's (Nasdaq: TSLA) patented battery pack innovation. And none of these cars can function without this specific technology. They aren't the only company that provides this technology, but everybody now believes they are the top dog. Especially, since they are well positioned for another point I also discussed with this lithium-ion "insider" at that private meeting in San Francisco. We mapped out how America is about to experience a lithium boom. And that it's a well-kept secret. For years, the U.S. Geological Survey has known that we have 5.5 million tons of lithium waiting to be mined in the United States… that already put us ahead of China. 18 million tons of lithium – enough to satisfy global production for 720 years – was found in one Wyoming mine. Meaning they are right here in America. Fortune, smiles yet again on one prospective "silent partner." This prospective "silent partner" already operates in America, employing thousands. It has strategically placed facilities in eight states on the East Coast, in the Mid-West, and the South. So Tesla (Nasdaq: TSLA) won't be looking too far away to pick this dark horse candidate. Here's another reason why that is important. Nobody Likes Paying an Arm and a Leg for Gas. Tesla (Nasdaq: TSLA) Has a Solution… How About Free? But the supercharger facilities Tesla (Nasdaq: TSLA) is building across the country will be what drives people to its electric vehicles. 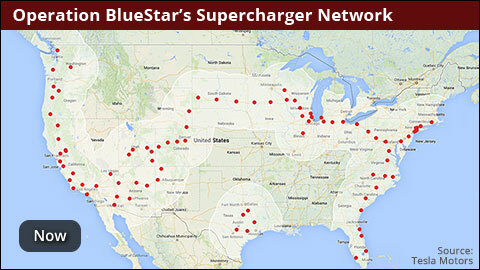 And a "silent partner" that already has existing operations across the entire United States will help enhance the cross-country deployment of this supercharger network. Because you'll be able to pull up… juice up your car in minutes… drive off… and you won't be charged a dime. 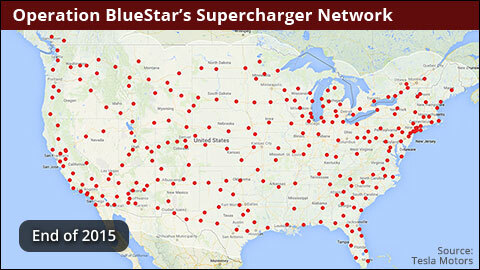 This is what their supercharger network looks like today. 80% of the U.S. population will be within convenient range of a station. By the end of 2015 it will be 98%. And America is about to become the biggest player in lithium. So all you need is something that connects the dots between these three pieces of the puzzle. This "silent partner" has already petitioned and received very specific exemptions from the U.S. Departments of Transportation and International Civil Aviation. These exemptions allow it to handle lithium-ion batteries, which are viewed as a hazardous material by our government. An amazing coincidence don't you think? Those exemptions were granted on January 1st of this year. Right when the whispers of this deal began to circulate. So it appears this prospective "silent partner" was given a helping hand from Uncle Sam as well. Now, I'm a big fan of Tesla's (Nasdaq: TSLA) long-term prospects. I love their stock and their technology. While many of the details of Operation BlueStar, including its location and "silent partner" are classified… the big picture is known. The Gigafactory is getting built. We know what it's capable of. The supercharger network already exists. We know by 2015 it will reach 98% of the United States population. So much of Operation BlueStar's future is cooked into Tesla's (Nasdaq: TSLA) current price. However, Wall Street is ignoring what I believe will be its "silent partner." Now, you may or may not be an expert on some of the investment ratios professional folks like myself look at when analyzing a company. So I'm just going to share two of them with you now. First off, this company is currently sitting on a forward price-to-earnings (PE) ratio of about 7.6. Historicaly, that's less than half the average of your typical member of the S&P 500, and about a third of a NASDAQ stock. So if it just hit "average" – you'd be looking at a 110%-178% winner. Second, Wall Street's bargain-hunter ratio is nicknamed PEG. 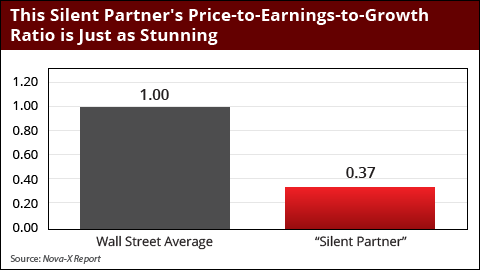 It takes your price-to-earnings ratio and adds another layer… its earnings growth rate. If a stock's PEG ratio is 1.00 – that means the market says it's fairly valued. If it's below 1.00 – it's cheap. This company is sitting at .37. So it's very cheap now. To hit "fair priced" it would need to rise another 170%. That's just based off what Wall Street knows – but they don't know everything. The folks on the inside of the company do though. Not One Corporate Insider Has Sold a Single Share of Their Stock. Again… Not one share has hit the market from one corporate insider for well over a year now. But they aren't just saving it for a rainy day. The company itself has covertly repurchased an estimated 543,651 shares of stock… all without capturing any attention… except mine. They're preparing for something big. Into one of the biggest companies in the world. Everything I'm hearing suggests they are now the preferred partner for BlueStar. And that announcement could arrive in the coming weeks. When it does, just the market fervor surrounding Operation BlueStar could bring its share price up 170%. That would simply allow it to hit those baseline PE and PEG ratios. But that's just Phase 1. The future is even brighter. Currently, its share price is trading at around 5% of Tesla's. But that's what makes it so exciting. You Don't Have to Invest a Great Deal of Money to Make a Once-in-a-Lifetime Fortune From This Venture. After All, 2,000% Winners Don't Come Around All That Often. This prospective "silent partner" has the upper hand. And they could deliver a massive 20-fold windfall. And to hit that kind of payday – I'm talking 2,000% – you have to see some of the "secret" revenue streams that are also attached to Operation BlueStar. As I mentioned, one of the Gigafactory's extreme advantages is its ability to fulfill the entire world's current demand for lithium-ion batteries. But it will also be able to expand to fulfill even greater future needs. Which is good because the demand for this technology is multiplying exponentially. In 2012 lithium-ion battery technology was about an $11.7 billion industry. Judging by my estimates, at its current growth rate, by 2017, when the Gigafactory's doors open – that number will be nearly $31 billion. By 2020, $79 billion. A decade from now? That means the "silent partner" in this deal will be tapped into this additional revenue stream. J.B. Straubel describes this as a "massive revolution in industrialization, on a scale that is kind of hard to imagine." He's right about the first part… it's a massive revolution. But he's wrong about it being hard to imagine where this could lead. Operation BlueStar Has Another Secret Revenue Stream. SolarCity develops off-grid energy storage systems for companies and corporations across 13 states, plus Washington, D.C.
Tesla (Nasdaq: TSLA) was already supplying SolarCity with the battery technology. Now, the Gigafactory will be able to offer SolarCity the ability to deliver even bigger solutions for the rapidly-growing, off-grid, U.S. energy storage market. "A threat to century-old monopoly utilities." What the Gigafactory is going to create is an alternative to the "take it or leave it" electricity costs we have been forced to deal with. Those solar panels and wind turbines being erected on the Gigafactory's campus will be creating dirt cheap electricity that will be sold directly to consumers who want to independently poewr their homes and businesses outside of the clutches of regional utility monopolies. 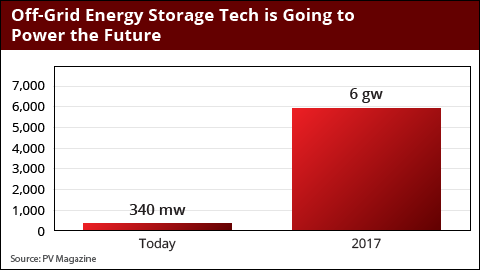 And the energy storage technology Straubel has developed will help them store it. Right now solar and wind storage technology supplies 340 megawatts of power to businesses and individuals. 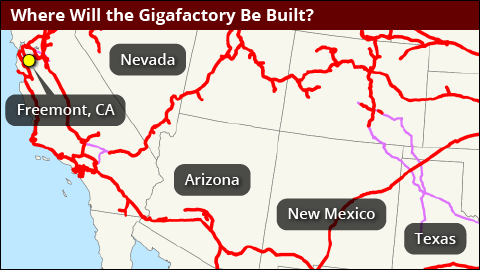 By 2017, perfect timing for the Gigafactory, the industry will have multiplied 18-fold over, to 6 gigawatts. Talking dollars and cents, that means a $2.7 billion industry is about to rise to nearly $49 billion. And the "silent partner" will be right in the thick of it. I've investigated every detail of this historic and highly-sensitive deal. And I Want to Rush it to You For Free! 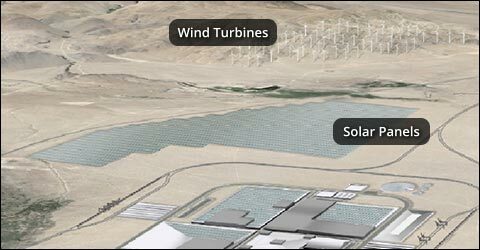 The "Gigafactory's" Final Location – Will it be Texas, Nevada, New Mexico, Arizona, or maybe a dark horse? I'll map out the exact location where this game-changing tech campus could land. 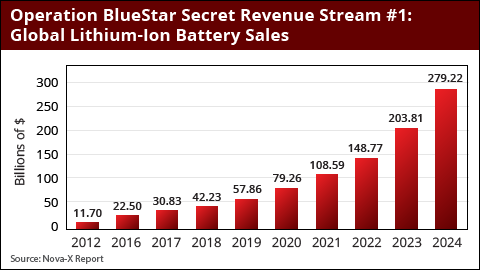 Operation BlueStar's Non-Stop Revenue Streams – From cars, to batteries, to off-grid, energy storage tech, and so much more… you'll see why this single deal could unleash an American economic boom that disrupts numerous industries. Tesla's Coming Payday – I'll provide the share price targets I feel are in play for this company. I'm looking at this as a long-term opportunity, so I'll show you when the right time to strike is… and at what price. The Identity of the "Silent Partner" – I'll reveal how their fingerprints are already all over Operation BlueStar. You'll see even more evidence that suggests the insider's at the company believe this deal is a foregone conclusion. I'll follow the money and the "under-the-radar" moves they've made to ensure they win this race. And I'll walk you through the profit timeline, so you can decide whether you want to try for fast gains (150% in months), or the historic windfall (2,000%+) that's waiting as this story develops. So regardless of whether you're someone with modest means, or are already well off – the success of this single deal could radically boost your net worth. I expect the details concerning the identity of Operation BlueStar's "silent partner" to get leaked within weeks. So I want to rush this investor briefing to you right now. That way you can act… and act fast… while there's still time. It's a $149 value and you don't have to pay a dime for it. I'm Recruiting Folks From Main Street Who Have Venture Capitalist Mindsets. I'm looking for people who want to get in as close to the ground floor on the innovations that will change our world. What's being developed with Operation BlueStar and its "silent partner" fits that billing. But there are so many other game-changing opportunities I want to share with you. With my Nova-X Report, I give people access to what I'm hearing from my network of contacts. I share the details of my meetings and dealings with the revolutionary minds in technology. Automobile technology has been a central focus of my investing for decades. I brought this up earlier, going back to the 80s with my work during Lee Iacocca's and Roger Smith's robotics revolution. The automotive sector held big promise then. Just as it does today. Since joining the team here at Money Morning, I've been showing folks how to profit from automotive breakthroughs. For instance, I recently targeted AutoBytel, which provides market research on automotive trends. It also is a perfect example of what makes the Nova-X Report such a unique initiative. Venture capitalists approach a business opportunity with the mindset of capturing multiple paydays from it. They invest one initial stake… then, as the profits start to soar in, they start extracting windfalls they can apply to other opportunities. This is how we approach most of the companies we set our sights on in the Nova-X Report. And Autobytel was a perfect example of this strategy. And We're Still Holding a Second Block That's Sitting on 135% Gains. I expect Operation BlueStar's payday to start growing much faster than that. Nothing I gathered from my private meeting in San Francisco suggests otherwise. Now, some of the critical elements in automotive technologies these days are classified as rare earth metals. This has been another specialty of mine, because I personally know the advisors and board members of many rare earth metal companies. This allowed me to lock folks into rare earth metal stocks before they became the latest investing craze. I targeted four specific companies – Rare Elements Resources Ltd., Avalon Rare Metals Inc., Quest Rare Minerals, and Great Western Minerals Group. Together they delivered 990% total gains in only 16 months. I haven't shied away from controversial investments either. Last June, I filmed an interview where I alerted members that the time to get into the digital currency Bitcoin had arrived. That's because, the week prior, I had met with the CEOs, founders and venture capitalists in California, who were at the forefront developing the currency exchanges and investment funds that would push Bitcoin into the headlines. Bitcoin Skyrocketed 1,192% Over the Five Months That Followed. And, as it continues to rise and pullback, I'm showing folks how to turn Bitcoin's volatility into a chain of winners. I've been able to reveal to members the under-the-radar players that have invented cutting-edge military technologies, long before Wall Street caught on. And, like most of the opportunities I'll target for you, a venture capital mindset was implemented. Folks following me secured one initial stake in Kratos… and we extracted multiple paydays from it. In Under a Year, Kratos Transformed Into a 106% Winner From Our First Block. And Then We Had a Second Block Pay Out 50% as an Additional Profit Kicker. Another defense contractor, GenCorp is a similar story. I recommended one initial investment into the company. We then cashed out a first block for a 75.24% winner. And we're holding the second block still which is up over 104%. Robotic surgery is still a relatively new treatment for cancer. But everybody inside Silicon Valley had set their sights on this for the future. And I uncovered the trailblazer in this field. A small company called Accuray. Accuray invented, and patented, the first robotic and non-invasive, radiosurgery system. It shot off like a rocket immediately. So much so that I decided the best approach was to extract profits in three blocks. Block 1 equaled 81% gains. Block 2, 49%… and Block 3, 39%. And since the winners started appearing after three months, this allowed us to target numerous additional opportunities with our gains. Getting in on the ground floor of biotech breakthroughs can pay off in spades if you know how to separate the real deal from the hype. And I knew what Organovo had invented was also the real deal. They control a technology that allows doctors to use a person's own DNA to bioengineer donor tissue for organ transplants. This can virtually eliminate the dangers of a body rejecting a donor organ, because your own tissue can be now be printed to help it accept that new organ. Organovo delivered two blocks of gains from one initial stake. The first block we captured shot up over 95%, the second, 35%. Santarus was an even bigger winner for us. It is a pharmaceutical company that patented treatments for ulcers and type 2 diabetes. I also knew it was a hot takeover target. And that's exactly what happened after I recommended it. The Second Block Rewarded Us with 91%. And it all started to flow in about four months after I shared it with members. My early work with the innovators in cloud computing helped me uncover a "Big Data" breakthrough being developed by Micron Technology. This is a company known mainly for semiconductors, but they are branching out. Big Data = (equaled) a Big Payday. Micron Technology First Delivered Us 105%. And Our Second Block From the Same Initial Stake is Up 152%. That's just a quick snapshot of what I've been able to do for folks looking to become "Main Street Venture Capitalists." Since Late 2012, I've Uncovered 42 Opportunities Across the Board for Folks to Grab Double- and Triple-Digit Winners. And today, you're invited to join me and use my Nova-X Report to become a "Main Street Venture Capitalist." I'm going to give you everything you need. 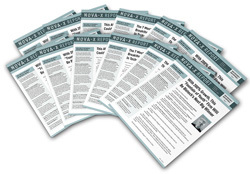 Membership Benefit #1: 12 Editions of the Nova-X Report – Every month I prepare an intelligence briefing that reveals the biggest tech stories and innovations I've uncovered from my investigations. You'll hear what I'm hearing in these meetings. You'll see what I'm seeing. If I'm examining a prototype of a new sensor technology, I'll explain every detail of it. If I'm touring a biopharmaceutical lab, it'll be like you're by my side. I also link these breakthroughs to the major trends and sectors they'll be disrupting and transforming. For instance, in a recent Nova-X Report edition, I shared a pioneer in "cryo-preservation" technologies. This is just starting to be used in cardiac and vascular surgeries involving implantable living human tissue. Already,1,000 surgeons at 800 facilities in the U.S. are implementing this company's breakthrough. But the growth is about to expand throughout 75 more nations. Another opportunity I disclosed involved a company that had developed a "honeycomb" advanced material that could create the lightest and fastest aircrafts in history. Plus, I shared a small biotech firm that, while investigating a mountainous area of Southeast Asia, came across a naturally occurring, biocompatible polymer called hyaluronic acid. It offers unlimited promise for longevity and pain management treatments… and unlimited profit potential. With each investment I reveal in my Nova-X Report, I provide streamlined analysis of the company's fiscal health, financial strength, and their sources of venture capital funding. This way you can quickly assess the profit targets and investment exit timelines I establish. Membership Benefit #2: Nova-X Report Trade Alerts – Whenever the moment arrives to maximize your returns, you'll receive an instant trade alert that notifies you that it's time to take our profits and move on to the next big play. It's worth mentioning again, since joining the Money Morning team in late 2012, I have delivered 42 double- and triple-digit winners across the board to those following my alerts. So, it goes without saying, we won't be holding on to these companies, admiring them like trophies on a shelf. We get in… we wait for the big rise… we get out… and we move on. Membership Benefit #3: Nova-X Report Weekly Dossiers – Every week I investigate the groundbreaking innovations, trends, and events that are emerging. Plus, I provide an in-depth assessment of our current investment recommendations. Membership Benefit #4: Nova-X Report Audio/Video Briefings – Before I recommend an opportunity to you, I always insist the company grant me up close and personal access to their operations. And that includes meeting their top brass. So whenever I interview the CEOs of major Silicon Valley companies, I bring a recorder or camera and I share this footage with you. This way you can get the inside scoop, straight from the source. Membership Benefit #5: 24/7 Access to the Nova-X Report Members-Only Website – This is the private, online portal where I store every intelligence briefing, investment recommendation, and alert. Membership Benefit #6: The Nova-X Report Concierge Service – Your membership includes unlimited use of a special concierge service where you can call or email my team directly. I encourage you to use this regularly, so you get the most out of this opportunity. The Nova-X Report is a unique and comprehensive solution. It's built so that even the newest investor will have the ability to compete with Wall Street's seasoned veterans. This provides everyday folks a leg up over the competition at these big firms. Because they already have enough advantages over Main Street. Which is why the regular price for a year's membership is $299. I intentionally set it at a rate that is within almost everybody's price range. But you won't have to pay anywhere near that today. You are going to get a deal that is too good to miss. Let me first say, for those who do pay "full price," it's still an incredible bargain. That was the case for Bob Kreen of St. Louis, MO. "I became a member about a year ago. Since joining you have tripled my net worth." "Michael, you have doubled my money!" Sometimes folks keep me up to speed on how they're doing on specific trades. For instance, I recommended a small biopharmaceutical company that develops synthetic vaccines and immune therapies for certain types of cancer and infectious diseases. Daniel McCarthy of Petaluma, CA, followed me into this target and he was glad he did. "Michael, I made over 250%. This was my best trade ever!" However, the Nova-X Report isn't about winning one or two trades. It's about transforming your entire portfolio and strengthening your financial security. What Randy Ashton shared with me makes this crystal clear. "Michael, I just took a hit of $44,000 in my investment portfolio, so I decided to start following your recommendations. In a nutshell, I am 5 for 5 so far. Thank you, Thank you. If you were here I would give you a big hug." Carter Roberts has done even better. "I made approximately 125k for the year." I just want to share one more letter with you. Because, it is simply inspiring. It comes from a man named Ryan Jared of Columbus, OH. "Michael, I have a wife and two kids. You have helped my young family recover from the 2008 crisis where we lost everything, including our home. Thanks to you I have been able to rebuild my nest egg." I would like to help you become my next Nova-X Report success story. I'm also going to include three more gifts to ensure you hit the ground running. Bonus Investor Briefing #1 – Industry 4.0: The Unstoppable Leader of the $14 Trillion Fourth Industrial Revolution – From wearable tech, to "Smart Homes," "Smart Cities," and "Smart Digital Doctors"… an innovation called MEMS is driving what is being called the "Fourth Industrial Revolution." By 2020, 50 billion devices will be connected to each other. And, as you'll see in this report, the companies building these devices will all have to kickback to the one with the 800-patent pipeline at this center of this Fourth Industrial Revolution. This report is valued at $99, but it's yours for free. Bonus Investor Briefing #2 – The $487 Billion Race to Conquer the Digital Battlefield – During a recent meeting with Major General Michael Mazzucchi, we discussed the Army's plan to conquer what he called the "digital battlefield." Today's wars are fought using military might, as well as real-time data and intelligence. Our armed forces are using a "Big Data" breakthrough to now harness the synergies that exist on the battlefields of the air, sea, and land. In this investor briefing, I discuss four highly-sensitive programs: The Air Force's"5th generation fighter sensors," as well as the "MQ-9/Block 5," the "Dominate in Unmanned Systems," and the "Global Precision Attack" programs. While the budgets for these top secret projects are classified, we do know that the Department of Defense is looking at this specific sensors technology to help streamline operations by $487 billion between now and 2021. Amazingly, there's one company that controls it. And it's on the verge of making investors quite wealthy. This report is valued at $99, but it's yours at no charge. Bonus Investor Briefing #3 – Ride the Wave of Ultra High-Def TV to a 500% Windfall – The next big change coming to your living room is UHDTV or Ultra High-Def TV. UHDTV is replacing Plasma, LEDs and every other former "next generation" type of television. Right now, one company has cornered the market on the 4K technology chips required to put these sets in every home. I estimate that you could make 500%, possibly more, as this media phenomenon catches on. This is also a $99 value and it's yours for free. That's a serious sum of money. And moments ago I mentioned that the regular price for membership to my Nova-X Report is $299. That would represent an already exciting 60% discount off the value of this total package. However, that's not good enough. I want to give you a sure-fire path to success as a "Main Street Venture Capitalist." And that means you need seed money to invest in these exciting opportunities. So every penny counts. Which is why you won't be receiving a 60% discount… or 70%… 80%… even 90%. How Does 92% Off Sound? When you hear the final price that allows you to lock in everything I've talked about today – it will be too good to pass up. Just like when I reveal the identity of Operation BlueStar's "silent partner." I'd like for you to take the next two months to review everything you are about to receive. Examine the investment opportunities I investigate in the Nova-X Report, as well as the weekly intelligence briefings and profit alerts. Review the members-only website. Take advantage of the Nova-X Report Concierge Service. If, for any reason, during the next 60 days, you feel this isn't right for you, all you have to do is contact me, and I'll return every penny of your subscription dues. Plus, the two Nova-X Report editions you'll receive during your trial. These gifts are my way of saying thank you, regardless of your decision. Let's not waste another moment. Below you will find a special button. 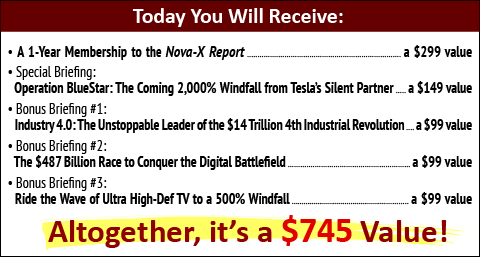 It will allow you to secure your 1-year Nova-X Report membership, as well as the collection of investor briefings I've discussed today… at a 92% discount. Plus, as one last surprise, I'm also going to send you a 3-disc trading course and quick-start manual – I've created for one of the hottest investment secrets around. You'll definitely want to see this. And at a $299 value on its own – this gift is a must-have. Especially, since you won't have to pay a penny for it. For more information, or if you would simply prefer to speak to someone directly, please call 800-513-6445 (443-353-4487 for international callers) during business hours. I'm Michael Robinson, have a great day! Copyright – 2014 Money Map Press, LLC. The Money Map Press is a publishing company that does not act as a personal investment advisor for any specific individual. Nor do we advocate the purchase or sale of any security or investment for any specific individual. The proprietary recommendations and analysis we present to readers is for the exclusive use of subscribers. Readers should be aware that although our track record is highly rated, and has been legally reviewed for presentation in this invitation, investment markets have inherent risks and there can be no guarantee of future profits. Likewise, our past performance does not assure the same future results. Warning: The past performance of any trade whether actual or hypothetical is not necessarily an indication of future results. Stocks, futures, currencies, commodities, CFDs, options and all types of investment trading can have large potential rewards, but also carry large potential risks. We make absolutely no representation that gains or losses demonstrated in services published by Money Map Press LLC are likely or achievable. Hypothetical trading examples also cannot possibly take into account the impact of liquidity or buyer and seller demand, and do not allow for slippage and associated trading costs and concerns. One must be aware of the risks and be willing to accept them in order to invest in the markets. One should never trade with money that one cannot afford to lose, and one must accept that there will be losses, and one must be able to sustain these losses, both from a financial as well as an emotional perspective. Recommendations are for the exclusive use of subscribers and can change at any time. This work is based on SEC filings, current events, interviews, corporate press releases, and what we've learned as financial journalists. It may contain errors and you shouldn't make any investment decision based solely on what you read here. It's your money and your responsibility.